VANCOUVER — Chalk up another first for Elias Pettersson. 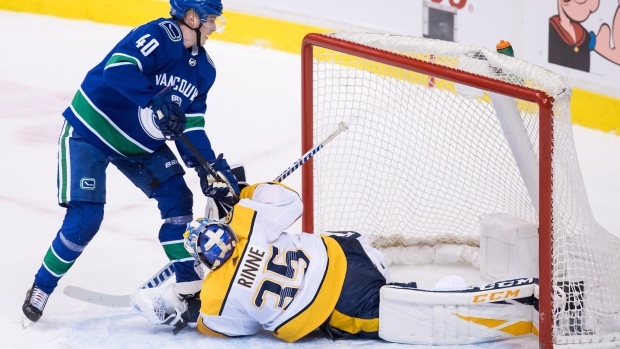 The rookie scored on his first NHL penalty shot Thursday as the Vancouver Canucks beat the Nashville Predators 5-3 to snap a four-game losing streak. "I was trying to fake and go right to left," said Pettersson, who also had an assist in the win. "It worked out this time." Bo Horvat said it's the kind of play the Canucks have come to expect from the 20-year-old Swede. "It was a highly-skilled move by a highly-skilled player," said Horvat, who had a goal and an assist. "You expect him to do those kinds of things and it's nice to see that go in for him." Pettersson was awarded the penalty shot with 71 seconds left in the second after being hauled down on a breakaway by Nashville defenceman Mattias Ekholm. He took his time getting to his feet. "I was mostly tired actually," he said. "I took some time to rest. I was ready to go when the ref blew the whistle." Pettersson, who was picked fifth overall in the 2017 draft, leads all rookies with 14 goals and 25 points. He started the season with nine goals and six assists in his first nine games but had just one goal and three assists in his last eight. "Some games you can create a lot and have zero points," he said. "Sometimes you create two chances and you have two points. "I'm only focusing on playing a good game, then the points will eventually come." Jake Virtanen also had a goal and assist for the Canucks, who have just two wins in their last 14 games (2-10-2). Alex Edler, on the power play, and Loui Eriksson also scored for Vancouver (12-16-3). Antoine Roussel had two assists. Nikolay Goldobin, a healthy scratch in Vancouver's 3-2 loss to Minnesota Tuesday, assisted on Edler's goal, giving him a team-leading 13 assists. Ryan Hartman, Colton Sissons and Matt Irwin scored for Nashville (19-9-1), which saw a two-game win streak end. The line of Horvat, Virtanen and Roussel was particularly effective, combining for six points, a pair of goals, and creating plenty of chances. "I felt like with our speed we were catching them on 2-on-1s a lot," said Virtanen. With just 26 seconds left in the first period Horvat took a feed from Virtanen then rifled a shot under the crossbar. "Bo had a great finish," said Virtanen. "It was a perfect shot." Virtanen's goal came early in the second period on a 2-on-1 breakaway started by Horvat. Roussel carried the puck into the Nashville end then slid a pass past defenceman Ryan Ellis that Virtanen blasted by Rinne. The Predators, who were playing without three of their top forwards and one of their best defencemen, looked sluggish early and trailed 2-0 after 20 minutes. "That was a little bit ugly," said Sissons. "We came out extremely slow and (with) a lack of determination and they were quite the opposite. "We didn't show up ready to play." "I thought we pushed back in the second half of the game, but it was too late," said head coach Peter Laviolette. "The start wasn't good, and it ended up costing the game." Canuck goaltender Jacob Markstrom stopped 26 shots. Rinne, making his sixth straight start, made 21 saves before being replaced to start the third period by Juuse Saros. He stopped four shots. The victory blew some confidence back into the Canucks' sails as the team heads out on the road for games in St. Louis, Columbus and Nashville. "I can't stress how huge that was for us," said Horvat, who now has nine points (three goals and six assists) in the last nine games. "We have to keep it going now. "We can't win one, then lose a couple. We have to keep our spirits high and keep the positive momentum going into the road and try and get some wins." NOTES: Eriksson’s goal was his first point in 11 games. … In the span of a 1:40 during the first period Edler scored a goal, flattened Nashville's Yannick Weber with a big hit, then was called for a penalty. … The Canucks had gone 0 for 12 on the power play in their previous four games. … The Predators played without forwards Kyle Turris, Filip Forsberg, and Viktor Arvidsson, and defenseman P.K. Subban, all due to injury.